MB2-700 Microsoft Dynamics CRM 2013 Certifications dumps Part 2. Summary: Microsoft Dynamics CRM 2013 Certifications dumps. Where can a user locate a list of recently updated records? How many cases can an Account record have at any given time? You delete a Lead record. By default, what happens to records that are related to the Lead record? A. All related activities, posts, and notes are disabled. B. All related records are deleted. C. All related activities, posts, and notes are deleted. D. All related records remain unaffected. end date and time is after the business closure period. To which entity type can you convert an Activity record? You need to correct the contract line. A. Open the contract line and replace the value in the Product field with the correct product. B. Delete the contract line. Add a new contract line that has the correct product. has the incorrect product referenced. contract line. Activate the new contract and then cancel the invoiced contract. You add a new product to the catalog. Which attribute of the new product record is marked as read-only? You are creating an Order. Which field does NOT require a value before you save the Order? MB2-700 CRM 2013 Certifications dumps Part1. MB2-700 Microsoft Dynamics CRM 2013 Certifications dumps. Which service schedule component should you use to measure skill levels? What role do keywords play in the Knowledge Base? A. Keywords are only used to manage the Knowledge Base. C. Keywords are used to search for articles. D. Keywords define the subject tree. A. Delete all articles associated with the article template. B. Unpublish the article template. C. Ensure that the user has the Delete Article permission enabled. D. Deactivate the article template. additional support cases at a cost. The Supreme Court on Thursday revised the counselling schedule for engineering admissions in the country for the academic year 2014-15. As a result the first round of counselling for engineering admissions announced by the Anna University in Tamil Nadu, earlier scheduled to begin on Friday, would be postponed. In its order a vacation Bench of Justices Vikramajit Sen and Shiva Kirti Singh directed the All India Council for Technical Education (AICTE) to complete the process of approvals of 521 engineering colleges within one week from Thursday. The first round of counselling which was to be completed by June 30 would now have to be completed by July 15; second round of counselling by July 22 and the third counselling by July 29. The Bench passed this order on an application from the AICTE seeking extension of the Schedule laid down by the apex Court in Parshvanath Charitable Trust and others vs. AICTE. 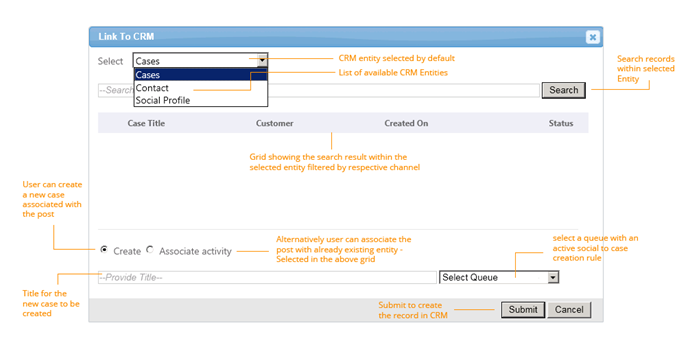 In Dynamics CRM 2013, when you create a new entity you can define the entities "Ownership” by choosing “Ownership” option. The user-owned or team-owned entities have five access levels: None, User level, Business unit level, Parent: Child Business unit level, Organization. 1. what difference b/w the Organization owned entity and User or a Team owned entity ? 2. can we assign/share the Organization owned entity records ?. 3.how many access levels for Organization owned entity ?. Experience: 5 to 9 yrs. Experience: 5 to 10 yrs. Experience: 4 to 9 yrs. | Salary: INR 4,00,000 - 9,00,000 P.A | Opening(s): 15. 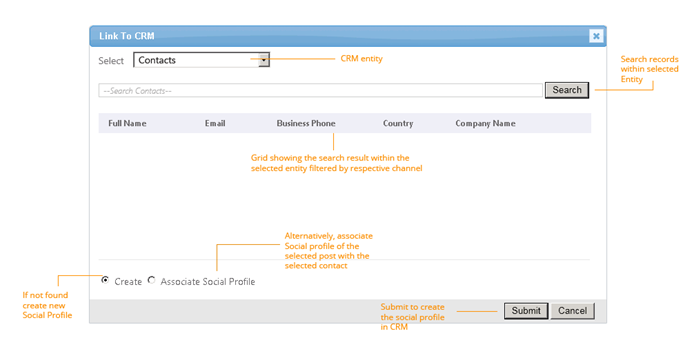 Summary: ms crm2013 sp1 Creating cases,social profiles from facebook,twitter,linkedin social media. The Social Care sample application provides a general interface and data model for automated conversion of social posts to Microsoft Dynamics CRM record types by using the social care generic framework feature. You’ll be able to automatically convert social posts to a Microsoft Dynamics CRM case and social profile,search existing records, and associate social posts and profiles to them. The framework can be extended to meet your custom scenarios for social engagement because the framework leverages Create, Read, Update and Delete operationson an entity API method delivered thru the OData endpoint of Microsoft Dynamics CRM. This readme uses Twitter as an example to showcase the offerings of the social care generic framework. · Twitter application registration. You must register an application in Twitter so that OAuthagainst Twitter can be used from the sample app. · On your Microsoft Dynamics CRM server, create a queue with “social to case settings” configured and activate the queue. The sample application needs to be updated to configure the connections to the database, Twitter, and Microsoft Dynamics CRM.The configuration steps are described as follows. 1. In Visual Studio, navigate to View>Server Explorer. 2. Right-click Data Connections, click Add Connection,select Microsoft SQLServer (SqlClient) as the data source, and then click Continue. 3. Specify the server name, enter Twitter as the database name, and then click OK.
4. To create the necessary tables, run theModels\Twitter.edmx.sql file provided with the sample from SQLManagement Studio. This will update your Twitter database. 5. Update the following connection strings in web.config accordingly. 2. Once you have the keys, update the web.configfile with the keys under the application settings section. The settings are “ConsumerKey” and “ConsumerSecret”. 1. Open the web.config file and change the app settings as indicated here. · Fill in the value for the “CrmServerUrl”setting to point to your server (don’t add the trailing slash mark ‘/’). · Set thevalue for “DeploymentType” to Online, IFD or OnPremise as per your Microsoft Dynamics CRM installation. 2. (Optional) Configure the watch list feature. The watch list button in the app UI searches for recent messages from Twitter for the specified search term. The “WatchlistKeyword” setting controls the search term. 1. In Visual Studio, select Build and then Build Solution. The sample app user interface (UI) and its functionality can be fully customized and extended to meet your business scenarios. To launch the sample app interface, select Debug and then Start without Debugging. Click on Signin with Twitter. This will redirect you to Twitter website to authenticate and authorize the application. Search:Enter a search term and click on Search to search for tweets. Watchlist:Manage customer sentiment byidentifyingkeywords, #tags, and @mentions thatidentify with your brand, product, or service and setup automatic social post-to-case creation. Select a social post that you’d like to create a CRM record for. The image shows the sample app UI and the intended functionality of the UI elements. 1. Select Cases from the CRM entity drop-down list. Note: You can extend the sample to include other entities. 2. Createis selected by default. 3. Provide a title for the CRM case (optional). If none is provided, the post description will assume the title of the case. 4. Select a queue from the list of configured CRM queues. 2. Search for a case. 3. From the search results, select a case that you would like to associate the post to. 4. Click to select Associate activity. 6. Provide a title for the CRM social activity (optional). If none is provided, the post description will assume the title of the social activity. 5. You don’t have to select a queue. 6. Click Submit to associate the social post as an activity to your selected case record in CRM. Source high influencers for your business requirements and save them as Microsoft Dynamics CRM contacts with their social profile information. 1. Select Contact from the CRM entity drop-down list. 2. By default, Create is selected. Alternatively, you can associate a social profile to an existing CRM contact record as shown here. 2. Search for a contact. 3. From the search results, select a contact that you’d like to associate the post authors social profile information to as a social profile record of CRM. 4. Click to select Associate social profile. 1. Select Social Profile from the CRM entity drop-down list. 2. Search to confirm the profile record doesn’t exist in CRM. 3. If the record doesn’t exist, click Submit to create the social profile record. 4. This action also automatically creates a contact record and associates the social profile record to it. · The sample files are not intended to be used in a production environment. You should deploy this sample to a test environment and examine it for interaction or interference with other parts of the system. 1. A queue with an active social-to-case creation rule is necessary for automated conversion of a social activity to a case record.The sample app doesn’t mandate queue selection when attempting to create a case. In such a case a social activity gets created but the case record isn’t set as a regarding object of the social activity. 2. Avoid creating duplicate cases for the same post. The sample app doesn’t try to check if the tweet is already tracked in CRM as a social activity on case creation. Code changes can be made in CasesController.cs::Show() to prevent duplicate case creation. if like this post please like crmonce page in facebook. - 4 plus years of experience on MS Dynamic CRM 2011. Summary:Sword hires MS CRM for long term UK opportunity. Requires extensive Dynamics CRM functional experience. Experienced in Microsoft Dynamics or similar CRM solution and has a successful business functional history. Will lead functional team through a requirements workshop and detailed requirements phase, including gap analysis. Will participate in requirements and code analysis phase. Sword India, an offshore unit and subsidiary of Sword Technology Solutions, UK belonging to Sword Group head quartered in Luxemburg. Our group has total manpower strength of 1000+ resources and has its operations in over 30+ countries worldwide. We are pioneer in delivering IT enabled business solutions that leverage our domain and business expertise along with a complete range of services. We have highly satisfied and reference able clients worldwide across vertical markets such as Banking, Insurance and Manufacturing. You can implement a check that identifies potentially duplicate accounts or contacts during creation or editing and notifies the user. The user can decide whether the new account or contact is required or is in fact a duplicate of an existing account or contact. Duplicate accounts can be discarded or merged with another account. For more information about merging duplicates, see Data Cleansing. The duplicate check uses the interface of the Business Address Services. You activate the duplicate check in Customizing for SAP NetWeaver, under Application Server Basis Services Address Management Duplicate Check Activate Duplicate Check and Determine Limit for BAPIs . Make sure that the duplicate check has been activated for both index pools (tables BUT000 and BUT052). The duplicate check can be implemented for accounts only, contacts only, or for both. The duplicate check is executed in the SAP CRM system in create and edit mode. The duplicate check uses the interface of the SAP NetWeaver Business Address Service. Dynamics CRM(6.1) Spring SP1 2014 Leo New features in Service Management. The Microsoft is one of the leading product based company and it is having so many Products like Windows Operating System,Visual Studio,Dynamic CRM.Now Iam going to Explain the Dynamics CRM 2014 Spring Release is now slowly being released across various geo for CRM Online. Leo updates are optional, i.e. after your CRM program and db has been upgraded to version 6.1.x you are now on the latest CRM release. You can see above highlighted Social Listening Configuration options now available. However, you need to subscribe to Microsoft Social Listening to be able to integrate your CRM with Social Listening. Iam focusing the improvements and new features introduced in the Service Management module. Once the updates have been installed the Service Management now has its own Area in Settings. Once you click on the "Service Management" it will display the list of Options and those Options are new Features in Ms CRM Spring Leo.you can in the below figure. The idea is clearly to move towards Service Automation. So how would this work? Well, to begin with, setup a Queue for receiving emails into CRM. In this version, Queues have been enhanced to now support Public and Private Queues. Public queues are visible to all. Something that was earlier available. And now there are private queues that are different from personal queues. You can associate members with Private Queue and all the members can access the items of that Queue. Next, configure Server-side sync to enable emails to route to CRM automatically without the need for any manual tracking of emails. You now have all mails in CRM. Using Automatic Case Creation Rules option, configure the conditions under which an incoming mail should automatically be converted to a Case. It has a detailed UI similar to the advance find filtering screen. 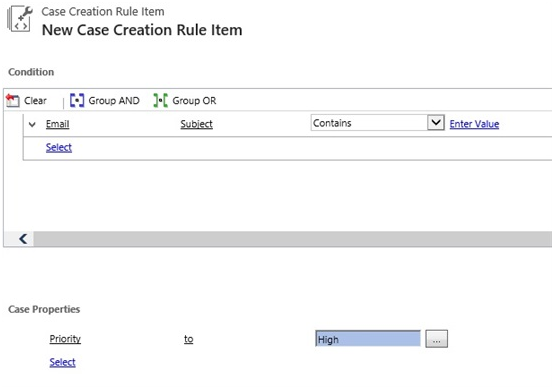 You can have multiple rules configured for case creation. The first rule that is satisfied by an email would be used to create the email. Now that the Case has been created for the email, you can go ahead and configure where the case should be routed to automatically. Do this using the new Routing Rule Sets. Similar to the Case Creation Rules, define the conditions for routing. You can setup multiple routing rule items. The first condition that a case satisfies will be used. Note: You can only have one Rule Set active at a time though. The end-to-end Email to Case process has been automated without requiring any mail intervention. Have you ever been in a situation where you receive multiple emails for the same issue and you would rather track them as a single Case or perhaps create a Parent case and associate all others as child cases to that one Case. Well, your wish has been granted in this version you can Create Parent – Child relationships for Case and also merge Cases. 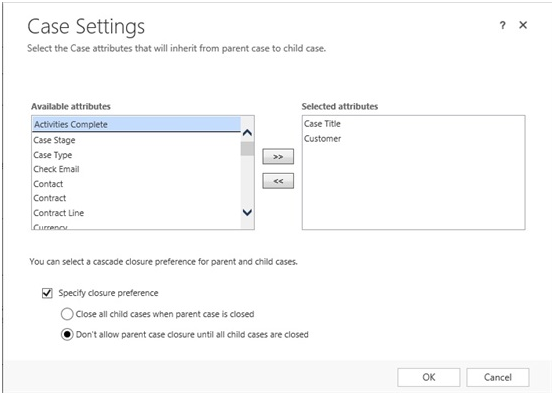 To set the properties that should be inherited by the child case when creating a new Child case, use the Parent-Child Case Settings option. This option is the relationship mappings that we do as developers when configuring 1:N relationship. The below screen is a user friendly screen that allows users to configure the settings without having to customize the entity. Besides the Mapping, it also allows you to define the Close behaviour for Parent & Child Cases. The Merge option that was until now only available for selected entities like Account, Contact has now been extended to Cases. You can now merge cases and define the Case that becomes the parent. And do you notice the fancy icons against the cases, well these represent the Case Origin. So yes you can now have Cases created in CRM from social channels as well. Next, this version introduces the concept of SLA. Organizations can define their SLA and monitor the performance on the SLA. You define SLA using the Service Level Agreements. OOB they have provided First Response By and Resolve By indicators of SLA but you can go ahead and extend it to other custom fields you wish to monitor as well. The Related Case field – select the field of which the SLA needs to be based off. This SLA Item Configuration defines the terms for the First Response By time for a Case. Define the conditions under which this SLA Item is applicable to Cases. The condition to determine if the SLA has been met. The Failure time defines your SLA for First Response by. The SLA uses the workflow architecture and you can define the actions in case of failure of the SLA or to warn in case the Case is approaching an SLA failure. You can set a default SLA for the entire organization or an associate SLA through Entitlements to each individual Case. And yes, now let us look at Entitlements. What is Entitlements? Well it is the same concept of Contracts less the deficiencies of Contract that made it unusable in the past. It supports Allocation Types of Cases and Hours. You have the entitlement validity dates within which the entitlements are applicable. You can now also define Entitlement Channels. The Entitlement Channel lets you set up the max counts per channel. This means the various channels through which Case can be registered. In this above case only Email & Phone is supported. The moment you create a Case and set the origin to either of these, the entitlement count would reduce. This now makes managing Entitlements way simpler than the Contracts.